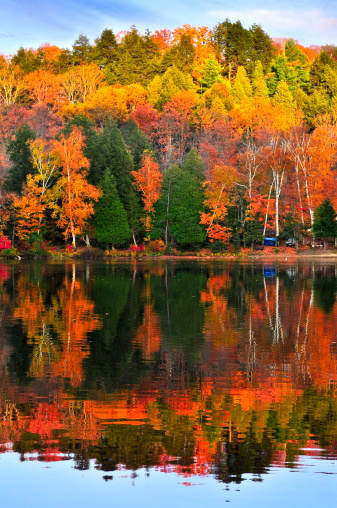 Nostalgia and inspiration are two of autumn’s greatest virtues. The sharp breeze is still pleasantly novel, and despite the shivering leaves and fading flowers, memories are fond and the atmosphere is bracing. So much can be squeezed from a crisp, sunny day in October. Makes me think of boiled cabbage. When I was a little girl, we would spend some fall weekends in Caledon, Ontario, where my grandparents lived in a quirky house perched on a hill and filled with emblems of the old country. The scrub tumbled down in all directions, landing at the foot of a forest. When the seasons flipped over, the canopy all lit up, there was often much ado about dinner in the bizarrely small kitchen. I, with my pigtails and wide-eyed curiosity, would sit on a stool and watch the frenzy through the gap between cupboards and counter top. The steam would cloud the window panes, and scents of dill and cabbage would whip around the tiny room. I understood very little of what was going on in this unmistakably Ukrainian kitchen. Those who can trace that hard, proud ancestral line back to an Eastern European country will understand how important hearty, earthbound ingredients are for the family. Good, strong food is to be celebrated and respected, used to reward, coax, and disarm. When there’s a lot of it, you better summon your appetite, and light eaters should beware the season of the cabbage roll. 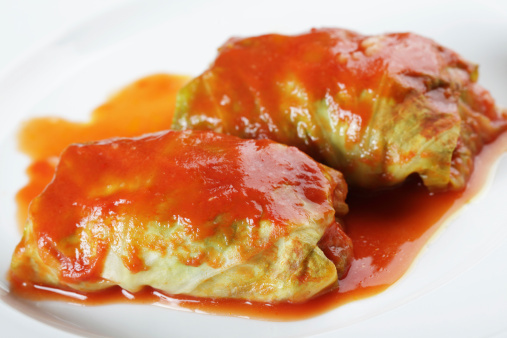 I grew up eating big, roly-poly cabbage rolls baked in tangy tomato sauce that, when you split them with a fork, spread across your plate quickly and completely. The casserole dish would snuggle into the rectangular space at every spread, and there was always another pan on deck. They were comforting, reasonably healthy, and irresistible. I can safely say that not one roll ever went to waste. These cabbage rolls took forever to put together (I tried my hand at it once or twice), which explains why they were reserved for special occasions. Well, nuts to that. I want to relive that savoury memory, and I want to do so on a weeknight. I decided to make a “cabbage roll” dish that could use up leftover cabbage, and wouldn’t require the deft hands of a Ukrainian matriarch or the patience of a saint. 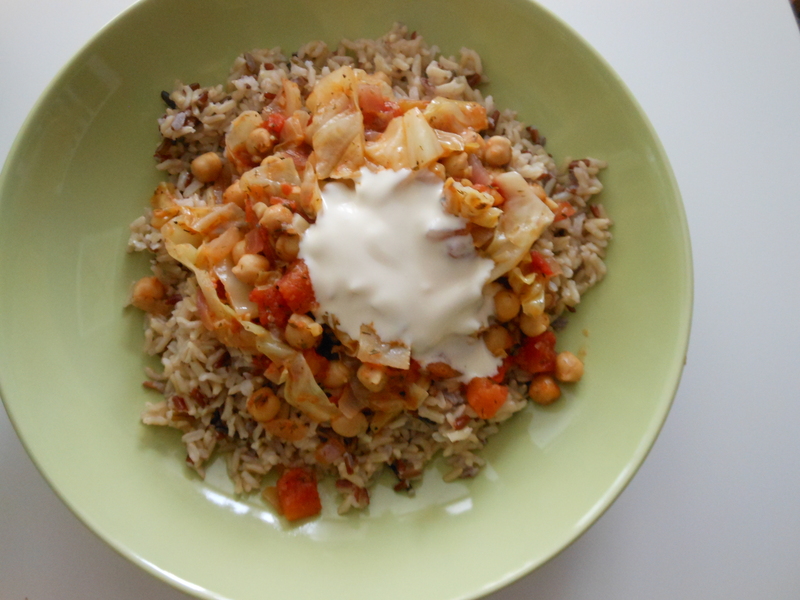 Here is a deconstructed cabbage roll, with a nutritious slant and a vegetarian disposition. Yes, I realize it’s not the traditional dish. But believe me, it was truly inspired by tradition, every part of a stubborn childhood memory that has stuck with me through three decades. The next chilly fall day that rolls around, get yourself a head of green cabbage, settle into the kitchen, and fog up the glass with an easy-peasy veggie stew that will leave you feeling full, warm and happy as a cabbage roll. In a large saute pan, melt 1 Tbsp of butter over medium heat, then add the onions and cook until soft. Add the garlic and cook, stirring, until aromatic, then pour in a generous splash of white wine. Bring it to a simmer, and cook until most of the liquid has evaporated. Add the cabbage, dill, thyme and pepper, and stir until combined. Add the veggie broth, lemon juice, tomatoes and chick peas, and bring everything to a boil, then reduce heat to low and cover the pan. Let the mixture cook for about 15 minutes, until the cabbage is soft and the flavours have mingled. Remove the lid and keep cooking for another 10 minutes, or until reduced. Mix in the reserved Tbsp of butter, adjust the salt and pepper to taste, and ladle it over a bed of rice. Top with a dollop of sour cream, (and a dash of hot paprika, if you’d like a little spice.